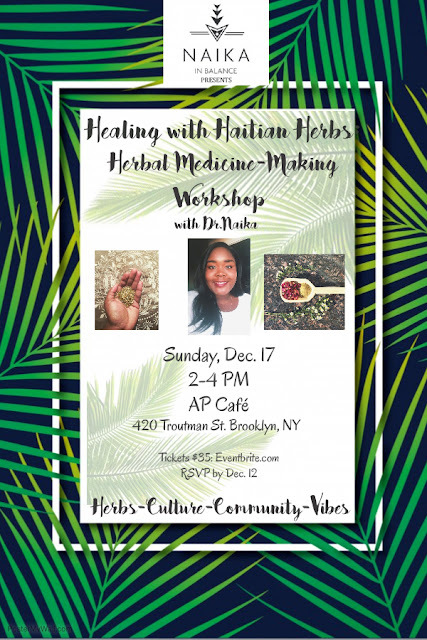 Healing with Haitian Herbs: Herbal Medicine-Making Workshop (Level 1)! [Update: As of 1 pm, December 12th, this event is SOLD OUT]. You spoke and I listened! I'm excited and delighted to finally announce that I’ll be hosting my first herbal medicine-making workshop to bring in the holidays! This has been the NUMBER ONE most highly requested workshop since launching my blog almost 6 years ago, so I'm so happy to make it happen for you all. We'll be vibing and learning about herbal-medicine on Sunday, December 17th, 2-4pm at AP Cafe in Brooklyn, NY. This event will be part informational and part hands on, giving you the opportunity to learn about the herbs we're using, then play with them. There’ll be music, there’ll be incense, there’ll be sweet vibes. Herbs sure are one of the best medicines out there. A friend of mine got really sick but was thankfully cured in time thanks to some powerful herbs.